The film Hate Radio, based on Milo Rau’s performance piece of the same name, explores the role of Radio-Télévision Libre des Mille Collines (RTLM) as an instrument of the Rwandan genocide. The program of this popular station consisted of pop music, sports coverage, political communiqués, and hate-filled calls to murder. 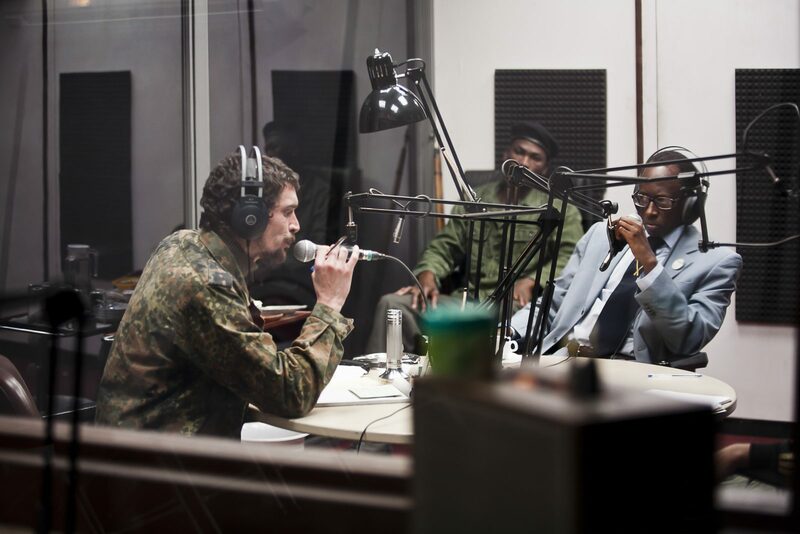 The project Hate Radio reconstructs an RTLM broadcast, based on documents and witness statements, which were selected and arranged by the author and director Milo Rau. The broadcast is performed in a replica of the original radio studio. Several of the actors playing the roles of the radio broadcasters are themselves survivors of the genocide in Rwanda. During the performance, the walls of the radio studio turn into projection surfaces for an intricate video installation with the selected stories of former perpetrators and victims. Here, the audience is confronted with the consequences of racist mind-sets. In doing so, Hate Radio demands that audience members be observers within the inner circle, at the centre of racist thought. This film screening is part of the international conference Representing Perpetrators of Mass Violence, which is being held from August 31—September 3 at Utrecht University. The film, lecture, and discussion are free and open to the public. Seats are limited; please click here to reserve a ticket. CAST: Afazali Dewaele (as DJ Jojo) , Sébastien Foucault (as Georges Ruggiu), Diogène Ntarindwa (as Kantano Habimana), and Nancy Nkusi (as Valérie Bemeriki). INTERVIEWS WITH: Patrick de Saint-Exupéry, Valérie Bemeriki, Jean-Louis Gilissen und Georges Ruggiu. Milo Rau is a Swiss theatre and film director, journalist, essayist, and lecturer. Rau studied sociology, German and Romance studies in Paris, Zurich, and Berlin with, among others, Tzvetan Todorov and Pierre Bourdieu. In 2007, Rau founded the theatre and film production company International Institute of Political Murder (IIPM), which features a uniqe, dense documentary form of political theatre with a special focus on the multimedia adaptation of historical or social conflicts. The Institute’s productions, campaigns and films (among others The Last Days of the Ceausescus, The Moscow Trials, The Europe Trilogy, The Congo Tribunal, Compassion. The History of the Machine Gun) have been featured at some of the most prominent national and international festivals, including the Berlin Theatertreffen, the Festival d’Avignon, and the Biennale Teatro di Venezia. Rau has won a number of prestigious awards and prizes, including the Swiss Theatre Award, the Hörspielpreis der Kriegsblinden, the Jury Price at the Festival Politik im Freien Theater, the „Special Price“ at the German Film Festival, the first Konstanzer Konzilspreis. Preis für Europäische Begegnungen und Dialog (Council of Constance – Prize for European Encounters and Dialogue), and, most recently, the International Theatre Institute’s prize for World Theatre Day. Support for this event comes from Utrecht University’s Research Focus Area Cultures, Citizenship and Human Rights and the Netherlands Organisation for Scientific Research (NWO).